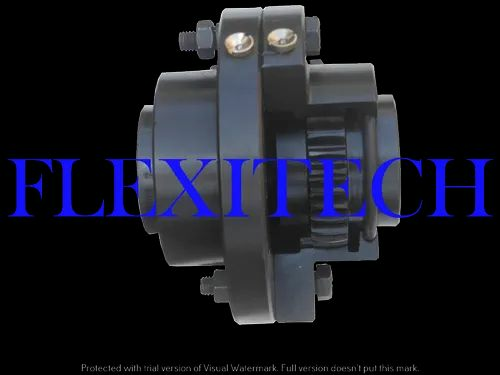 FLEXITECH INDUSTRIES is one of the prominent names engaged in the manufacturing and exporting of high quality couplings such as Flexible Gear Coupling, Pin Bush Coupling, Muff Coupling, Resilient Coupling, Nylon Gear Coupling, Star (jaw) Coupling, Brake Drum Geared Coupling, Brake Drum with Flexible Geared Coupling, tyre coupling, rigid coupling, chain coupling, gear coupling, Grid Coupling, Pulley, sprocket, shaft, gears & worm gear, worm shaft, power transmission component, other precision machine components. As per drawing or sample. With a vast industrial experience, we have emerged as one of the renowned manufacturers, exporters and suppliers of a wide range of Industrial Couplings and other Precision Machine. Our high precision products include Brake Drum with Flexible Geared Couplings, Flexible Gear Couplings, Nylon Gear Couplings, Bush Type Flexible Couplings, Jaw Couplings (Star Coupling) and Brake Drum Geared Couplings. Apart from this, we also offer Muff Coupling, Rigid Coupling and Tyre Coupling. These are manufactured using high grade raw material, which make them highly functional and durable. Our products are available in various specifications as provided by our clients. Our strength lies in our highly qualified workforce and sophisticated machines, which provide quick and effective production of the products. We have experienced and qualified technical staff who efficiently operates hi-tech machines and maintain their quality standards. Our niche lies in fabricating high-end Industrial Couplings and other Precision Machine, which enables our customers to augment their machines at the same time reducing environmental impact. Further, for proper storage of our products, we have well facilitated storage unit.